Vaguest of plans, what with Andy away, had been to hitch a lift with Rene to a Palinesque place East of Ipswich. Then Rene couldn't make it. No matter, I'll fly solo. Pop the DellAir into the pannier for a bit of weight training, jaggedy six mile journey and some pell-mell pedalling along King's Way. Rounded the regal roundabout into Queen's Way. Not got the best reputation, this part of town. I should know since the paternal line was brought up around here. Now where's a secure spot for the bike? Guess I'll have to take the only free table in the Rendezvous Cafe, all others being occupied by salt of the earth types named Ray or Terry or Jack or Barry. Everyone knows everyone else (and their kids), seemingly. Proper community. A world away from the black and white icons on the wall: Clint, Frank, Elvis. Not quite up to one of the breakfasts -- choose from set or full or new or all-in -- but a ham, egg and chips will more than do. My order number is 51, though they're sure they'll find me. Sipping my original Lucozade, I spy a sign on the far wall that smokers have an "undercover facility" out back. That's considerate. Unbranded condiments: check. Fruit machine: check. Perfectly good food: check. Heck, there's even a children's menu. 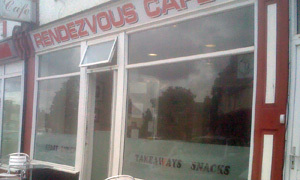 I'd call it a draw between the Rendezvous and near neighbour Kenny's. And my bike was still there. If it was a car -- Suzuki Supercarry. If they were passing by -- Brian Jacks.